Its my Friday lay day blog and today a short topic on banking. The Fairfax economics editor Peter Martin had a good story yesterday (October 22, 2015) – Westpac, Commonwealth Bank protect mortgage profits no matter what – which bears on the lack of competition that exists within the Australian financial sector. The Authorised deposit-taking institutions which are defined under Section 8 of the Banking Act 1959 are divided between the Major banks (ANZ, CBA, NAB and Westpac), other (smaller) Domestic banks, the Foreign subsidiary banks (foreign banks authorised to carry on banking business in Australia through a locally incorporated subsidiary) and the Mutual ADIs (Building Societies, Credit Unions and Mutual banks). There were 160 ADIs in Australia in June 2015. The big-four major banks hold 78 per cent of the total assets held by ADIs. The Mutuals hold 2 per cent. In recent days, despite interest rates being low in Australia at present as a result of record low policy rates being maintained by the Reserve Bank of Australia, two of the big four (major) banks have pushed up interest rates on their mortgage loans. Some people have been puzzled by this move. There is no surprise really given the past behaviour of these market gouging institutions. If the Commonwealth Bank and Westpac had been located anywhere else, they wouldn’t have pushed up rates. He refers to the implementation of the new Basel III rules on capital adequacy which has seen the local prudential authority APRA requiring the banks to add more capital as a risk against insolvency. In its press release (August 8, 2013) – Implementation of the Basel III liquidity framework in Australia – APRA outlined some of the detail of the new system. The difference is that the problem on the liability side is much more easily (and in most cases cheaply) repaired by a guarantee than the problem on the asset side. The sudden risk of insolvency in Australian banking was simply a more tractable problem than those experienced by other Anglosphere nations. The banks might counter that they only needed the guarantee because other governments around the world were guaranteeing the debts of their national banks. This does not sit easily against the survival of banks without wholesale funding guarantees in many countries where banks had stayed within the old operational templates— for example Australia’s neighbours Indonesia and Papua New Guinea. In any case, this avoids the point. The Australian banks’ dependence on government-guaranteed debt was exceptional: in July 2009, Australian banks accounted for 10 per cent of the world’s government guaranteed debt. Through foreign borrowing to support domestic lending, the big four Australian banks were active, enthusiastic participants in the global shadow banking system that was now unravelling. The ABS also said that the major banks could have “secured liquidity from the Reserve Bank” – yes, corporate welfare to survive as their businesses were facing insolvency. In the United States and elsewhere where this has happened the banks’ shareholders simply accepted lower returns. More capital made the banks safer, less deserving of an outsized return to compensate for risk. APRA publish statistics reporting – Quarterly Authorised Deposit-taking Institution Performance – which provides some instructive information. One indicator of performance is Return on equity, which is the net profit (loss) divided by average shareholders’ equity. 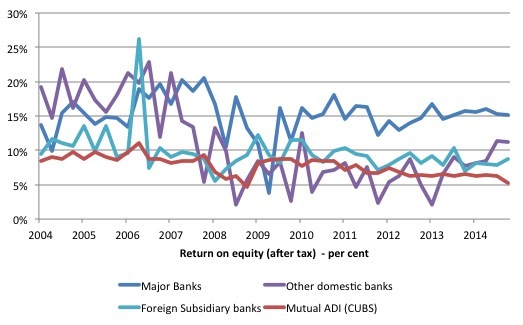 The first graph shows the performance of the Australian banking sector in general and the Mutual ADIs from the September-quarter 2004 to the June-quarter 2015. The banks clearly enjoy a sizeable gap on returns to their shareholders relative to the mutuals (which are owned by the depositors) and generally charge lower fees and pay their management lower salaries. The next graph breaks the banking sector down into its components (Major banks, Other domestic banks and Foreign subsidiary banks). It is clear which segment is driving the gap shown in the first graph – the ‘big four’ major banks. 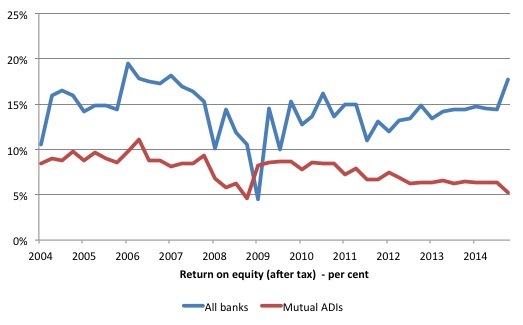 All the other ADIs are generating about the same returns on equity. But the major banks are some 5 per cent higher yet they are the ones that enjoy the government guarantee. The smaller Mutuals can go broke and the government has allowed some of them to become insolvent in the past. But the major banks will never be allowed to crash – the government will always bail them out. This is an out-of-control greed sector and the Government will not bring them to heel. The Fairfax article notes that the interest rate hikes are beyond those that would be necessary to maintain existing profitability given the extra costs of holding more capital under the Basel III requirements. The only thing that will make them think twice is losing business. The smaller banks aren’t threatened with the same higher costs. They already heavily back their loans. They are in an excellent position to steal Commonwealth and Westpac customers. So all Australian users of our banking system – you know what to do. I wrote about this sort of individual empowering tactic in this blog – Time for progressives to adopt more direct actions. While the major banks dominate the sector and exert market power (given the gap between the returns) they also rely on our inertia to maintain their supremacy. There is plenty of scope for us to push more ‘competition’ into the market by using our capacity to choose. So withdraw all funds from your major bank accounts and refinance your mortgage loans through the Mutuals. If enough Australians did that then the Major Banks would have to stop gouging their customers. Disclosure: I only have a Building Society ADI account. The news from Portugal is potentially very good, with Socialist Party overcoming historic enmities with the Communist Party to form a coalition with the additional support of the Left Bloc. They have have the right to lead Portugal after the recent elections gave them a majority in the Parliament. The majority of Portuguese voters rejected the austerity-obsessed previous regime and are demanding change. The Socialist Party’s coalition partners support a Eurozone exit and have seen the capitulation of Syriza in Greece. They know that exit is the only way of restoring democracy in Portugal and stopping the Troika from further ruining their nation. The Communists have indicated they are abandoning austerity and its instruments – the Stability and Growth Pact (and the augments like the six- and two-packs and the Fiscal Compact). They also reject privatisation and will move to restore public ownership of the banks, power, communication and transport. The Socialists, which are the moderates in this coalition, nonetheless plan to restore workers’ rights and protections and enforce the minimum wage (so that employers cannot get around the laws using independent contractors). They have also proposed substantial public spending boosts to kick-start the recessed economy. We will be following the events with interest. At least, the left in Portugal at present does not seem that they will be the pushovers that Syriza has become. The Iceland Magazine reported (October 14, 2015) – 26 bankers already sentenced to a combined 74 years in prison. They were convicted of crimes such as market manipulation and embezzlement of bank funds. Why haven’t more Wall Street investment bankers gone down yet? The track here is – Ranglin Man – from the Rotterdam Ska Jazz Foundation – and it is off their 2007 CD – Motiv Loco. The whole album is fantastic. Big ska sound with plenty of jazz for bop and syncopation. This is their dedication to the great Jamaican guitarist Ernest Ranglin. I guess he would like it. My band – Pressure Drop – is playing this Sunday at the Bar of Bengal Room, Kindred Studios, 212 Whitehall Street, Yarraville, Melbourne. Come along if you want a nice afternoon of reggae/rock steady/dub. Supporting band this weekend is Blak Roots from 15:00. Why do Australian banks borrow from abroad to support domestic lending? Also I’m super keen to get rid of my accounts with the big banks but I’ve put money in a high interest account with RAMS and now realise they were bought by NAB during the GFC! It’s hard to find small guys. I’ll keep looking. What should we do? Should we break up the big banks? Should we setup a public bank again to compete with them? Or both? Talk about a great big tax (rent) on everyone in paying the big banks profit margins of up to 18%! Wow license to print money indeed! I think this is why Liberal governments are preferred by the big end of town they know labor is the only party that would hint about doing anything about the big banks so its good business practice to donate to the liberal party and stop labor getting voted in. The whole system is so corrupt and immoral its sickening. You are missing nothing. You are spot on. Domestic lending is not funded by offshore borrowings. This is a complete myth. The process is unnecessary but introduces substantial risk to the Australian economy – as our financial system replicates that of a currency user. The regulatory requirement for duration should be abandoned since the banks are always funded in local AUD. The policy is akin to the government passing legislation the budget deficit should be financed in USD (I’m sure Bill would rile against that!). I suggest that banks, certainly large banks “across banking in the world” are actually protected (unjustifiably) by governments, i.e. taxpayers. Of course politicians and their criminal-bankster friends are very cagy about this: reason is that they want to have banks backed by taxpayers while pretending they aren’t. My preferred solution is for governments to announce loud and clear that no bank or its depositors will under any circumstances be rescued, just as failing garages and restaurants are not rescued. That ipso facto means that all bank creditors in effect become shareholders. That in turn means that anyone wanting complete safety for their money must have it lodged in a totally safe manner, e.g. lodge it with the central bank or put it into government debt. And that in turn equals full reserve banking. US money market mutual funds will soon have to abide by the latter sort of rules. The entire bank industry should do likewise. Which in turn requires an expansion of the sovereign investment in banks to replace the current insured deposit base that would flee the banks – otherwise you won’t get enough lending into the economy to maintain aggregate demand under the current interest rate targeting system. If government wants to make that change in the current system, they need only increase interest rates at National Savings. Deposits will then flow to National Savings and be replaced in the banks by central bank funding – which would make the central bank ‘own’ the banks. Banks can only be controlled by proscribing what they can lend money for and how they can lend it. It’s time to stop obsessing about liability management and start looking at asset quality. Well I’m with a mutual, anything to deprive these leeches of an ounce of my blood. Nationalise the whole damn lot of them. Don’t faff about, cut the serpents head off. I just checked for the exact same type of loan I have. My mutual is charging a 4.93% basic rate against the Westpac gougers basic rate of 5.48%. Of course with Westpac there are loads of bamboozling introductory offers, fees and other tricks up their sleeves which make their advertised rates look lower at first glance. The mutual is very straight up and clear about the fees and rates. I am afraid banking control goes much deeper then what the capitalist managers and centralizers (socialists and communists ) tell you. Until people realise this they will be continually lead up the garden path. The President of Portugal has given the charge of forming a cabinet to the conservative PSD despite the agreement between the Socialists and Comunists. The president argued that a coalition between the Socialists and the PSD was more reasonable because the other left-wing parties were “antiEuropean”. I am begining to see the hand of Brsussels and the ECB behind his move although I might just be getting paranoid. Stuart, I doubt you are paranoid. The charge that these groups are anti-European just because they are anti-Euro is absurd nonsense. This coalition is less reasonable and might well fail the electorate. I agree that “the current insured deposit base would flee the banks” – well not all of it would, but significant amount would. I also agree that that would reduce demand. But, the latter problem is easily dealt with, as every MMTer knows, by simply having the state create and spend money (and/or cut taxes), or “creating fiat” as Roger Erickson tends to put it on Mike Norman’s blog. Net result would be that demand and numbers employed stayed constant, while total amount borrowed and loaned (i.e. total debt) declined. Indeed, I always laugh at the numerous people who advocate more bank lending in one breath and complain about the size of debts in the next. Re your idea about increasing rates paid by state run savings banks to those wanting to hoard money (National Savings in the UK), I’m all for people stocking up on whatever amount of money they want, but I don’t see why anyone else should reward them for doing so. Re your idea that bank assets should be regulated rather than their liabilities, the problem there is that regulating assets puts a big constraint on what banks can do. If a bank wants to lend to very risky borrowers, why not – as long as relevant bank shareholders are up for it? And as for the fact that risky loans wouldn’t always work out under full reserve, that’s not a big problem because (unlike the existing system where too many non performing loans results in banks going insolvent), insolvency is next to impossible where a bank is funded just by shares. Further on Bill’s comments about Portugal: it appears that the President isn’t going to let the Socialists and Communists form a government, despite their gaining a majority in the recent elections. This is effectively a coup. Salazar would be pleased. Now that all 4 major banks have increased interest rates most commentators suggest the RBA will be forced to lower rates in November. But what effect would this have? If the RBA lowers interest rates by only 0.25% surely the banks wouldn’t bother lowering their rates back again. As a lay person it seems strange that the banks can have so much influence over an RBA decision. Some high risk loans have brought huge benefits. Every Silicone Valley start up is risky. Of course some fail, but the winners bring big benefits. @Todd I absolutely agree it’s no longer a competitive market but really it seems to be a cartel. It’s probably very hard to prove its a cartel legally but I bet you the banks all know the position they are in and are using that position of power cunningly. The timing is in their favour I’d argue with the change of prime minister who’s busy getting ready for an election and a very business friendly government not likely to pill them in line. It’s a joke. I also look at petrol prices and see very similar behaviour now that Coles and Woolworths control most of the petrol stations and we no longer have refining in Australia. I would argue it’s a cartel as well as they know by keeping their prices high other petrol stations will do the same. Again it’s probably hard to prove legally. We simply need more competition to resolve these issues. @Ralph aren’t those Silicon Valley loans from venture capitalists own cash rather than from bank loans? The VC’s know they’ll lose on a lot but win big in a small number so are happy to invest strategically. Banks tend to be much more conservative I thought. I’d prefer if they invested in more startups but didn’t think they do. It’s quite hard to get a business loan for most businesses even if not as risky as these startups. In Australia we even have a government department setup to fix failures in the market for lending to renewable energy investments that banks deem too risky. It’s actually making a profit for the government and has made billions of renewable energy projects viable. The conservative government wants to close a profit making renewable energy investment fund. How that makes any sense I don’t know but that’s an example of how conservative the banks are here. Go get funding off Crowdcube, funding circle, etc. Bank credit needs to be rationed. Agreed: a lot of Silicon Valley start-ups are funded by venture capitalists. But I don’t think that greatly dents my point, namely that there is no reason to clamp down on risks taken by banks as long as shareholders are up for it. Indeed, under Lawrence Kotlikoff’s version of full reserve banking, people can choose what sort of bank to buy shares in: banks which concentrate on risky stuff like NINJA mortgages, or banks which only do conservative mortgages. Plus there is a lot of talk about the alleged need to get banks to direct more loans to small businesses (which are inherently risky) rather than boost house price bubbles. Responding to Chris; Since banks can lend from thin air, is the idea of borrowing overseas to spend just a carry over from commodity money days? I.e, it could be abandoned with no bad consequences. I was a believer in the line that banks are [or were] exempt from Client money Rules [ Werner]. But now client money has to be “quarantined” safe from bank failure, [since when?] I assume then that such money just sits in bank accounts with the only purpose being to shore up the bank’s equity, and which sets a limit on the bank’s ability to lend. I haven’t been able yet to confirm this. Thank Ralph that makes sense I guess if they’re transparent with shareholders. I agree there should be much more lending to small businesses etc rather than existing housing. Interestingly there are new business models in lending like this: http://www.smh.com.au/money/peertopeer-lenders-attract-investors-with-doubledigit-returns-20150923-gjtht0.html I’m not sure how safe that is but the big banks are starting to take notice and may try and buy them out.